Students of two schools of the city brought laurels by bagging top four positions in the class X results of the Punjab School Education Board which were declared today. 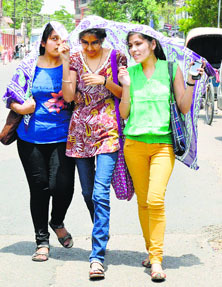 Riya of RS Model Senior Secondary School Shastri Nagar topped the state by scoring 97.69% marks. Mahima Nagpal of the same school shared the second position in the state with Pankaj Mahajan from Gurdaspur district with 97.23%. Indeed, it was a big day for the management, teachers and students of RS Model Senior Secondary School, Shastri Nagar, three students which have bagged the top three positions in the PSEB class X examinations. Securing top ranks on the merit list has been a tradition with the school. Members of the Inspector 2010 Batch Union, Punjab (Food, Civil Supplies and Consumer Affairs), went on a strike today in protest against the dismissal of two Inspectors. The union staged a dharna in front of the office of the District Food and Civil Supplies Controller, Ludhiana. Awarded: Kuldeep Kaur, a chemistry lecturer at Government Senior Secondary School, Bharat Nagar, Ludhiana, has received Malti Gyanpeeth Award for her contribution to the field of education. Reacting on the statement of Captain Amarinder Singh that the Aam Aadmi Party is dominated by Naxalites, AAP leader HS Phoolka said it demonstrated frustration among the Congress leaders. 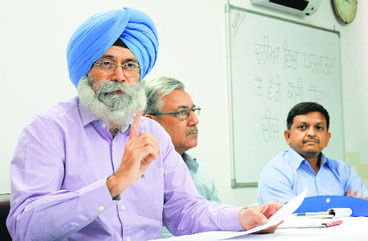 Condemning the statement during a press conference, Phoolka said all leaders of the Aam Aadmi Party in Punjab had a long-standing track record of social work. For bringing peace to the departed souls and their kin, Action against Corruption, an organization, performed a havan on the accident prone elevated road in Ludhiana on Monday. Chandrkanth Chaddha, president, held Municipal Corporation authorities responsible for the fatal accidents and demanded that compensation be provided to the families of the deceased. 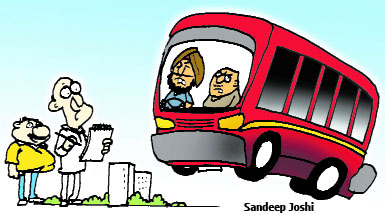 The members of organisation said that steps should be taken to prevent accidents on the elevated road. With contaminated water being supplied to various parts of the city, residents are falling prey to diseases such as diarrhoea, cholera and gastro. The Health Department organises medical camps, but these are of no help. Residents of the area falling under jurisdiction of Ludhiana and Sangrur districts have vowed to adopt elements of ‘Dark Nights Calendar’ and ‘Social Policing’ in their routine life. Besides helping cops in surveillance during dark nights, unemployed youths would be prompted to work as watchmen in private organisations. The row over putting up advertisements in the city and generating revenue refuses to die down. While those using government land (MC) feel that they had been charged exorbitantly by the civic body, companies putting up advertisements in malls and multiplexes maintain that there can be no comparison between the two as those installing unipoles and hoardings on government land get a prominent display. The Punjab Urban Planning and Development Authority (PUDA) will make yet another attempt to sell a chunk of land measuring 8.18 acres on Ferozepur Road (a national highway), right in front of Mini-Secretariat, through a public auction on June 24. The land with a reserve price of Rs 415.71 crore had failed to attract even a single bidder when it was earlier offered for sale on February 17. With changing sociological dynamics, parents these days are becoming much more involved in upbringing of their children than yesteryears, according to experts. Whereas fathers used to be looked at as disciplinarians and distant, but fathers these days are deeply involved in bringing up their children. Thanks to smaller families, the involvement of parents in the upbringing of their children is much more nowadays. The disintegration of joint family system has also led to parents spending more time with their children. 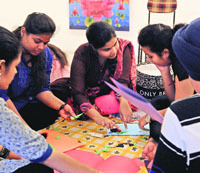 Playful Minds, an art and craft summer camp, is being organised at Gallery Artmosphere for children wanting to engage themselves in creative activities during the vacation. The camp that will run till June 12 will give the children, who are otherwise busy with studies, a chance to take up their hobbies and interests. Camp organisers Meenu Mahajan and Leena are fine art teachers. An art exhibition was organised at MS Randhawa Art Gallery in Punjabi Bhawan today. Fifty works were put on display. 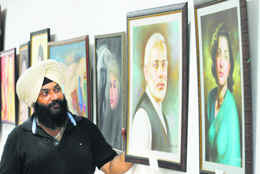 Balwinder Singh from Khanna made a painting of Prime Minister Narendra Modi and Bollywood actor Nargis Dutt. He said he admired Modi and his style of speech. Guru Angad Dev Veterinary and Animal Sciences University is holding its thirteenth convocation on June 5. Dr KML Pathak, Deputy Director General, Animal Science, Indian Council of Agricultural Research, New Delhi, will be the chief guest at the event to be held at Pal Auditorium on the campus. Dr Pathak will also be delivering the convocation address. Facebook and social media are turning into delight for bird lovers and wildlife enthusiasts. Many pages dedicated to the birds are constantly viewed and liked by city residents. Some pages such as “Birds of Punjab” and “Birds of Chandigarh” are raging popularity among nature enthusiasts and bird lovers. Despite a letter sent by the Assistant Commissioner (Technical), Zone D, to the thana in-charge, Shaheed Bhagat Singh Nagar, no FIR has been lodged against a telecom company officials who dug a road in an “illegal” manner on April 14, causing financial loss to the MC and inconvenience to the public. A case under sections 323, 506 and 509 of the IPC and Section 3 of the SC, ST Act 1989 has been registered against an advocate for allegedly thrashing her colleague Rupina Mohini, who belongs to a Backward Class. The Health Department is observing June as Anti-Malaria Month to raise awareness on the disease. Many programmes and workshops are planned for the month under the guidance of Civil Surgeon Dr Subhash Batta. The Machhiwara police recovered a body of a young woman lying in the bushes towards Garhi Bridge near Machhiwara. Some persons informed the police in the morning about a body of a woman lying near Garhi Bridge towards Powat Bridge. A police team reached the spot and found some injuries on the neck of the woman. A case has been registered against three cousins, who levelled allegations against each other and indulged in a brawl, in the Jawaddi area last evening. Inspector Arminder Singh said the case had been registered against Karamvir Singh Kavi, Tejinder Singh Raja and Sarabjit Singh under Sections 323/341/342/506/427/149 of the Indian Penal Code. Ludhiana Sports Club warded off a stiff challenge from Sant Fateh Singh Club of Dolan, Jagraon, before coming out victorious 8-6 and booked a place in the semifinals during the ongoing Fifth Olympian Prithipal Singh Hockey Festival being held at Bibi Surjit Kaur AstroTurf Stadium in Jarkhar village on the Ludhiana-Malerkotla road.